These trees are an odd shape, short, wide trunks with masses of thin spindly branches coming out of the top. They have been planted in a grid and are fascinating and somewhat eerie to look at but I have never found a satisfactory way to photograph them before. Rather like this! Being a bright and well prepared sort of person, I have been reading up on Intentional Camera Movement techniques after the event!!!! I thought there was something wrong with my eyes when I saw this image. Thank God it is the result of your editing. Love it though - every intriguing. 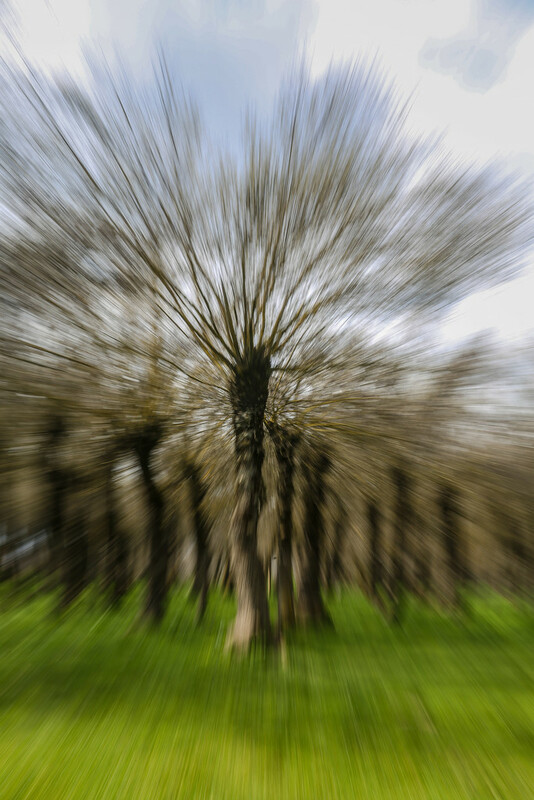 Is it ICM or zoom burst? Looks more like the burst to me but still a very effective way to get the shot! @dide Yup, perhaps we are more adventurous if we try to achieve without reading the instructions/doing the homework beforehand!!! @ruthmouch Now you know what zoom burst is! This is it! Cool effect- it's like the tree is sort of exploding! Cool. It's like a forest in a children's movie that's alive.